Mark Robbins is Associate Principal French Horn with the Seattle Symphony. He performs as Principal Horn with Seattle Opera, including playing the horn calls for Wagner’s Ring cycle. He is also a member of the Chautauqua Symphony Orchestra, a summer orchestra in Upstate New York. Also a devoted chamber musician, Robbins has performed often with the Seattle Chamber Players and on the Seattle Symphony’s Chamber series. Formerly, he was a member of the Florida Philharmonic Orchestra in Miami, and has played at the Spoleto, Tanglewood and Olympic music festivals. Also an active teacher, Robbins is on the faculty at Cornish College for the Arts and at the Chautauqua Music Festival. 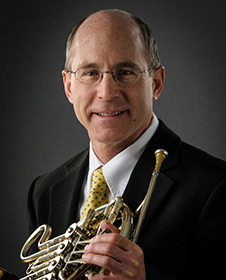 He is the horn coach for the Seattle Youth Symphony Orchestra, and teaches horn in the Seattle area.